HomeFood and DrinkWhat's a Manale, Anyway? The origin behind the misleading classic New Orleans dish that is barbecue shrimp. 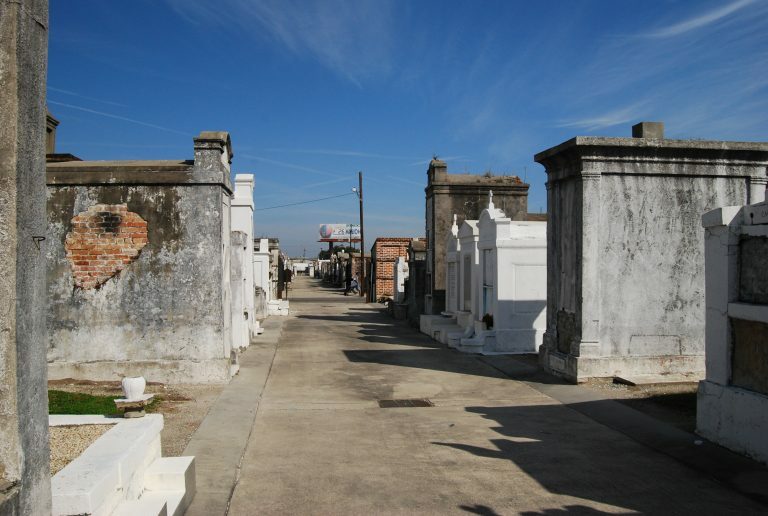 While a few classics like Galatoire’s and K-Paul’s are included, Hicks focuses most of his attention on independent, family-owned operations. Among them you will discover a remote Italian roadhouse with a shady history, a “greasy spoon” specializing in attitude, and a blue-collar lunchroom that pours steaming boiled crawfish out of a brown paper bag onto yesterday’s newspaper. Institution Pascale’s Manale also fits the family-owned criteria and is famous for a dish that’s been confusing diners for decades. 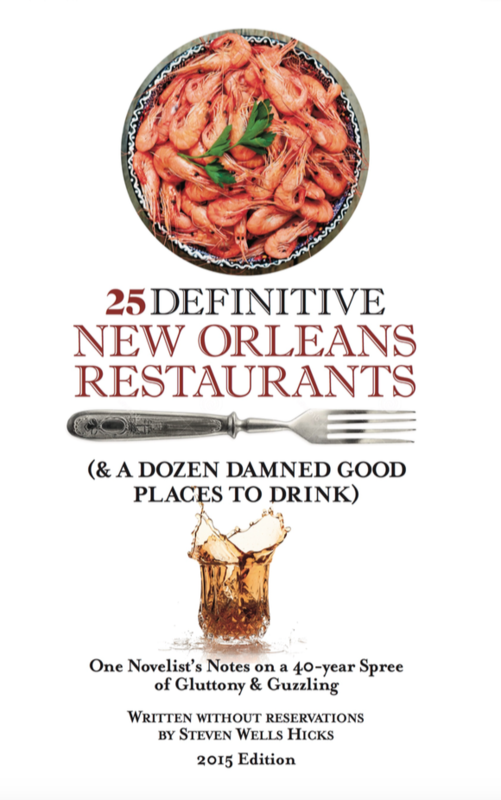 In this excerpt from 25 Definitive New Orleans Restaurants, Hicks attempts to explain how barbecue shrimp secured such a time-honored spot on Pascale’s Manale’s menu — and how the dish got its name when it has nothing to do with barbecue. Get the Pascale’s Manale Barbecue Shrimp recipe here. Considering that the provenance of New Orleans Barbecue Shrimp was a comedy of errors, it should come as no surprise that no one could agree upon the best way to cook it, either. Generally regarded as one of the most iconic dishes in the entire New Orleans Creole-Italian repertoire, Barbecue Shrimp has nothing to do with barbecue in the way you probably know it. There’s no hickory or mesquite, the sauce isn’t tomato based and sweetened with either brown sugar or molasses, and people in Kansas City and Memphis (and Texas and the Carolinas) don’t argue about whose is best. This much is known, or at least widely accepted, or maybe suspected: New Orleans Barbecue Shrimp came into being sometime during the mid-1950s in the kitchen of an Italian family restaurant named Pascal’s Manale. Opened in 1913 by one Frank Manale, the Napoleon Avenue restaurant eventually found its way into the hands of Manale’s nephew, Pascal Radosta, who decided to rename the place after both of them. Legend has it that on that fateful evening in the 1950s, one of the regular customers named Vincent Sutro had just returned from a business trip to Chicago and started singing the praises of a dish he’d eaten there that, as far as he could remember, had shrimp, butter and a lot of pepper in it. He asked Pascal’s chef, Jake Radosta, if he could make some, and the chef said he could try. Chef Radosta went into the kitchen, cooked up something that was as close as he could get to the fellow’s vague description and waited while the man tasted it. After a taste or two, the man said it wasn’t what he’d eaten in Chicago. Owner Radosta decided to put it on the menu, where it’s stayed ever since. No one knows where the name came from. One guess was that this all happened at the point in time when the suburban backyard barbecuing craze was at its zenith and, despite being a misnomer, the name was coined to cash in on the fad. Whether that’s true or not, there is a delicious irony about a misrepresented recipe being given a misleading name and still becoming a New Orleans classic. There are two leading schools of thought on the dish’s preparation, and the advocates of each are pompously cocksure that they are correct. The first is that all the ingredients are mixed in a baking dish and put in the oven, and it would not surprise me to learn that this is how the dish was originally prepared in the kitchen at Pascal’s Manale. The alternative belief is that the whole process is accomplished on the stovetop in a cast iron skillet. 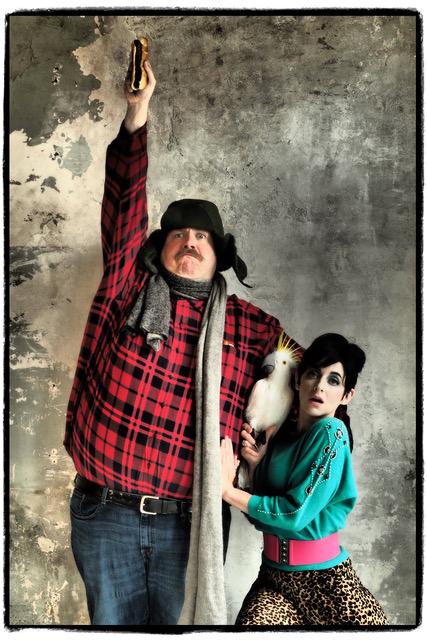 I have a sneaking hunch both factions are correct, based upon an item I read several years ago that claimed the dish’s widespread popularity actually occurred when Paul Prudhomme reworked it for the Brennan family as they prepared to open Mr. B’s Bistro in the French Quarter. Prudhomme is a notoriously fast chef well known for cooking with blazing heat at high speeds, and it seems logical that the creator of blackened redfish would rethink a time-honored recipe for ease and speed of preparation in a commercial kitchen. In writing this, I wanted to be as accurate as possible, so I went to the Internet to do a comprehensive recipe search. There are dozens of them, including numerous ones claiming to be the original recipe, and these “authentic” guidelines cite both cooking techniques. Well, of course they do. All things considered, it wouldn’t be real New Orleans-style barbecue shrimp if people could actually agree on its preparation. But no matter which method of preparation is used, the results are so similar that it takes a true culinary maestro to tell which method was employed. The four driving, traditional flavors are fresh Louisiana shrimp, an exceedingly generous amount of pepper, garlic and enough butter to make a cardiologist scream uncle. Varying recipes call for shrimp stock, Worcestershire, Italian herbs, mint sprigs, Tabasco, white wine, cream and even tomatoes. It is a remarkably flexible dish that readily accommodates any number of personal touches. There is some disagreement (of course there is) of whether the Louisiana shrimp should be cooked beheaded, peeled and deveined or intact so the fat contained in the shrimp heads can be incorporated into the sauce. Essential to any preparation is an abundance of crusty French bread to sop up the peppery butter sauce. When you order barbecue shrimp at Pascal’s Manale, a bib is de rigueur. Peeling the shrimp is part of the process, and before the empty plate is taken away, your fingers will be butter-soaked, and possibly wet from licking them (providing no one is looking). Of course you’ll look silly; every adult in a bib looks silly, so get over it. One of the latter meals my late father and I had together was at Pascal’s Manale, and all these years later, I treasure the memory of our laughing and pointing at each other in our stupid bibs. Despite the restaurant’s age and success, it still retains the aura of a neighborhood, family place. Located on a corner in a shaded, residential area, Pascal’s is set in an unobtrusive building on Dryades Street, which also features an old-line steak house named Charlie’s, and an unusual structure originally built by the Mexican consulate that now is home to the city’s most discreet bed-and-breakfast, complete with a clothing-optional swimming pool. From the street, you enter a large, wood-paneled waiting room that also houses the restaurant’s cocktail area and oyster bar. It’s a friendly, lively area, which is good because some people spend a considerable amount of time there. Like many New Orleans neighborhood places, Pascal’s has an unwritten policy of moving guests, even those with reservations, down the line when an old friend or regular decides to drop in – and with nearly a century under its belt, the restaurant has an impressive number of friends. While the waits are usually not inordinately long, a little patience is recommended, as are a cocktail and a dozen of the city’s better oysters. There are two medium-sized dining rooms in the place, the motif of one leaning toward sports, and the other seemingly planned to be a “nice” family place, but somehow it ended up looking like the parlor in a cathouse. Beyond the barbecue shrimp, the menu doesn’t stray far from the predictable — some veal dishes, a couple of steaks, seafood grilled or fried. While the shrimp is certainly the headliner at Pascal’s, the other dishes are treated as anything other than afterthoughts. It’s a good kitchen, the kind anyone has the right to expect of a place that’s had nearly a century to work out the kinks. While the dinnertime mood at Pascal’s is jovial, the bibs ludicrous, and the food quality normally hovering somewhere between very good and excellent, lunch at the restaurant offers one of the city’s exceptional bargains. A small loaf of French bread is hollowed out, filled with barbecue shrimp swimming in its peppery butter and served as a poor boy sandwich. While bibs are recommended, I’ve managed the sandwiches with a number of napkins and minimal wardrobe damage. Summarizing Pascal’s Manale is a challenge, at least for me. The food is very, very good, but I can tick off a dozen places that offer better cooking without breaking a sweat. There’s a reason for that, and it afflicts several of the city’s more legendary kitchens. 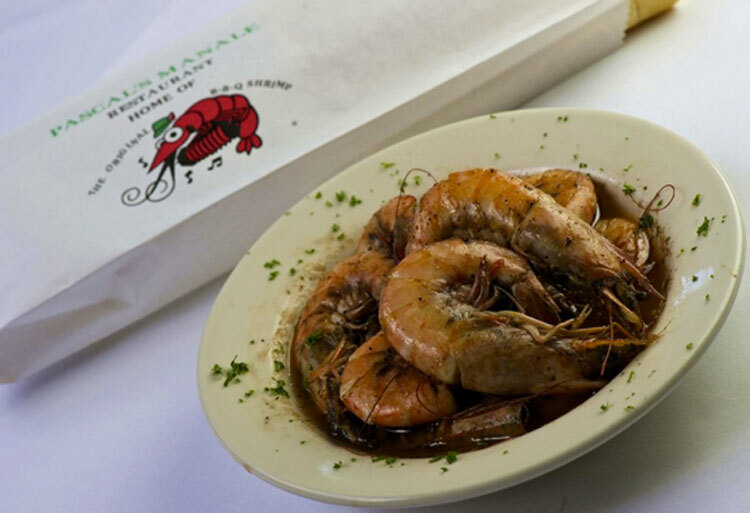 For more than fifty years, Pascal’s has been able to claim itself the originator of New Orleans barbecue shrimp, but with that title comes a tacit obligation not to vary one iota from the recipe as originally conceived and developed. In the meantime, innovative chefs have enjoyed an open field in which to tinker with and tweak the dish, and this has doubtlessly led to some improvements on the original. 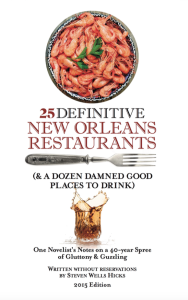 Such a fate is not new; it has befallen such venerable culinary institutions as Oysters Rockefeller and soufflé potatoes at Antoine’s, the muffuletta as created by Central Grocery Company, the charbroiled oysters developed at Drago’s and many others. It begs the question, at what point does a dish as originally developed become a museum piece, a culinary curiosity overshadowed by the creation of a chef enjoying the freedom to explore and innovate? The truth is, there’s often a very real difference between a dish that’s been invented and one that’s been perfected, but they are both of interest to the curious epicure. For whichever reason you’d consider a visit to Pascal’s Manale, historical or hedonistic, chances are you won’t be disappointed. We have one copy of this book in either Kindle or paperback format to give away to a lucky reader. To enter to win, comment here about your own experience with barbecue shrimp (or lack thereof) and we’ll choose one winner by April 16. U.S. only entries for paperback please. I once almost broke up a marriage serving Manale’s shrimp because the husband ate so much and then asked his wife: why don’t you ever make this for me. Her reply: “Why Harry, I make this for you all the time!” They’re still together, but don’t come to our house for supper any more. Pascal’s Manale is my father’s favorite restaurant and he remembers going with his father when he was younger and made sure to bring us there everytime we visited New Orleans. The last time I ate barbecue shrimp at Pascal’s Manale was with my parents and boyfriend. My dad was trying to be careful by wearing his white bib but accidentally shot barbecue shrimp sauce across the table onto my boyfriend’s brand new white shirt that was a Christmas gift. A hilarious moment and another wonderful meal in NOLA! My Mom made us Barbecue Shrimp as children and I will never forget the first time she told us what is was called, being in Oklahoma all our lives we swore she was crazy if she thought that was Barbecue! We still get a laugh to this day on that story! Barbecue Shrimp in the traditional sense is not to my liking. Barbecue Shrimp in the Louisiana sense is supremely wonderful. Shrimp, butter, pepper — what’s not to love? The barbqued shrimp is simply THE best! And the winner is Jane! Thanks to everyone who shared their stories. Many years since I had my first and last BBQ shrimp at Pasqual’s. Looking forward to next Feb when we will be there again.